Over the past few days we went on a backpacking trip, high in the Cascade Mountains. We hiked, fished, and got really really dirty. We did not have cell service. As we were driving down the mountain to head home my phone dinged repeatedly letting me know I had come into service, and I began to read the messages. “Is your house OK?” “Should I be worried?” “Is that fire right by you” These were from friends and family members. 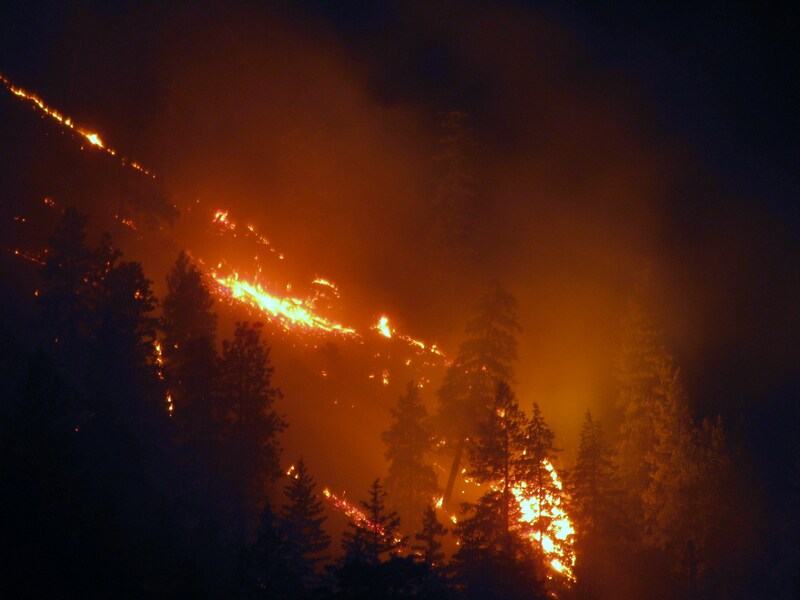 Not to make light of wildfires, but when one is mentioned near our town, and there are plenty of them, we get messages from people we know, checking to see how near to us they are. I was reading down the list of messages and I noticed one was from my neighbor who was also out of town. Crap. If they were concerned, it must be close. A web search of the fire proved it was on our road. Our road is roughly eight miles long, so there’s no way to tell how close it was from that information alone. We stopped by Frank’s house and he had it on his DVR from the news the previous night. The footage confirmed our fears. It seemed as close as it could be without actually being on our property. As we drove home, we could see clouds of smoke. Driving nearer we saw the helicopters flying water from the nearby river and dropping it over the mountain tops. And as we drove onto our driveway, we saw the fire, across the road. So, we spent last night not at the fireworks show in town but sitting on our lawn and observing the fire show in front of us. This morning it appears that things are under control, though not fully out. Here are some photos from last night. 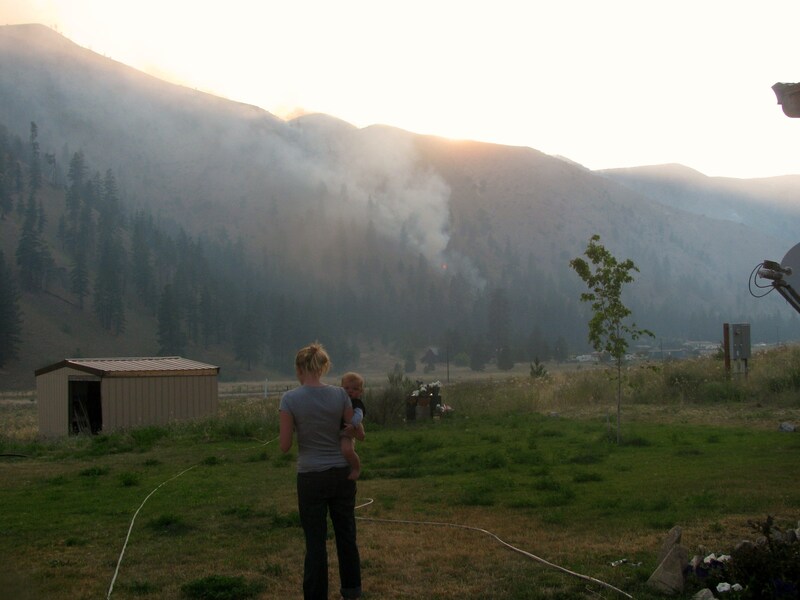 Me and Lucy looking at the smoke coming over the hill. 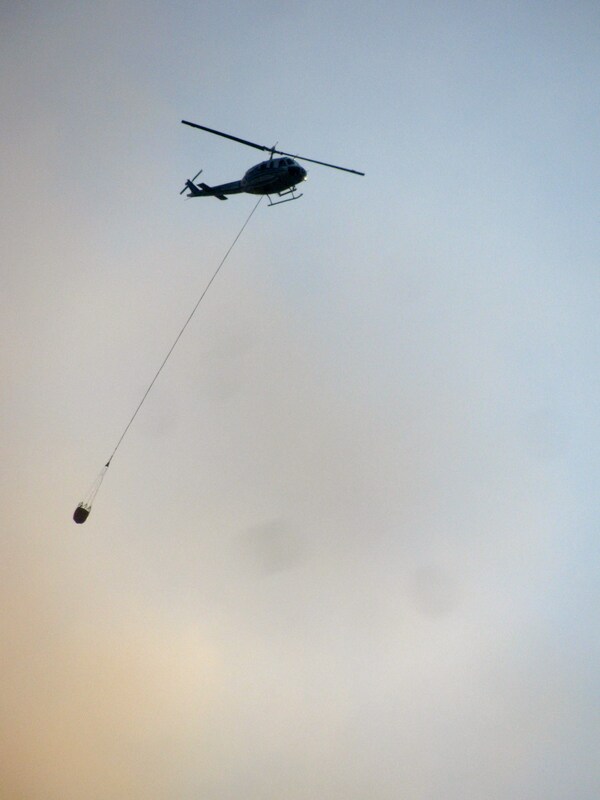 Helicopter carrying water to the flames. 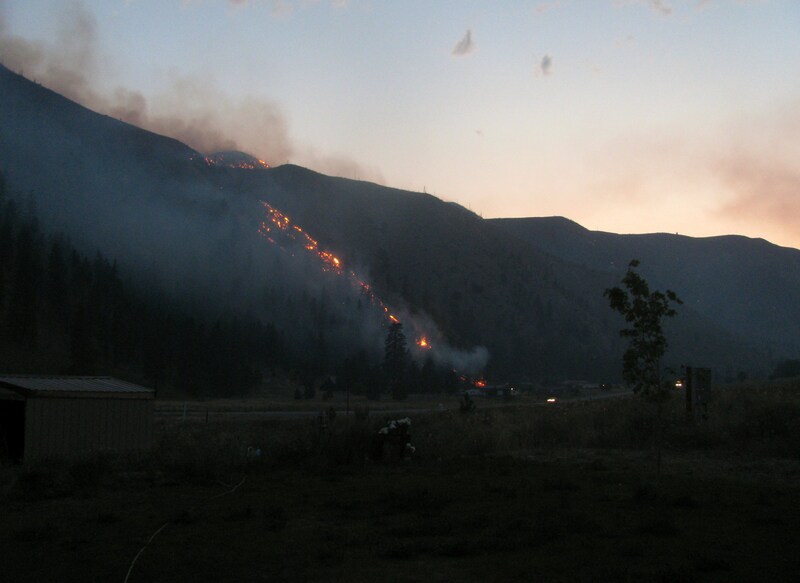 As the sun went down, the firefighters made some sort of “line of fire” to contain the flames in effort to keep them from burning further down the coulee. 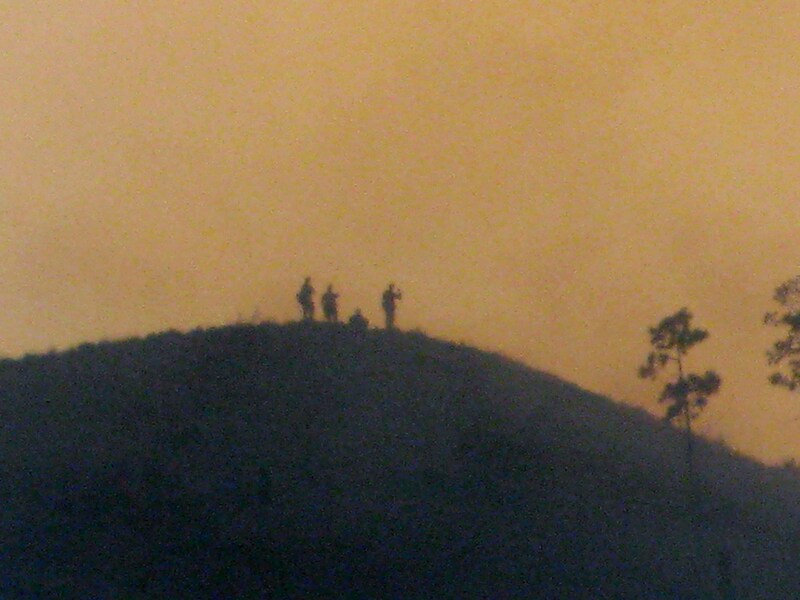 Four of the firefighters on the top of the hill. I can only imagine their job is tough, but this hill they were on is crazy steep and watching them move up and down with shovels and torches was exhausting just to watch. 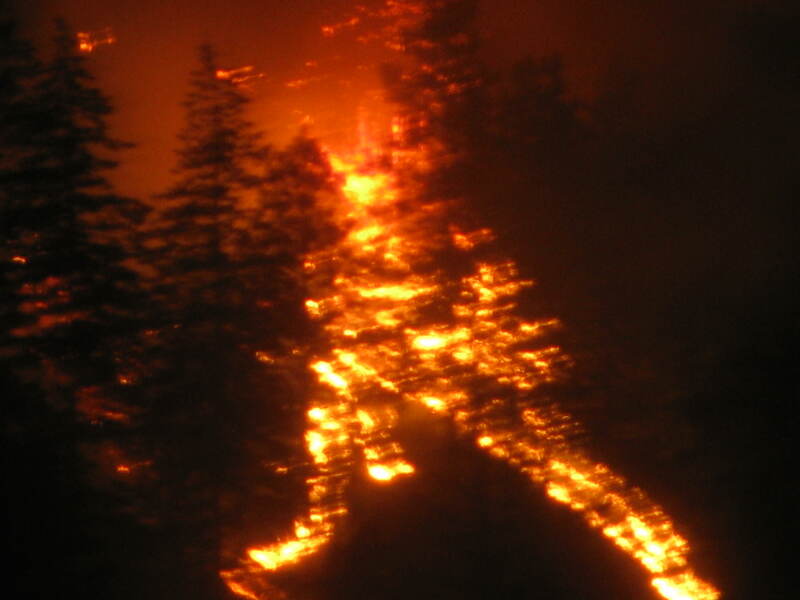 The fire grew larger as it became dark. This was about the worst of what I saw. This morning I can no longer see flames. The bulk of the fire is behind this hill. Last I heard the fire is 600 acres and 75% contained. Outside it smells like perma-campfire and the smoke is thick. But I think we’re safe and our house will remain standing. Though Mr. Pilver says things can change quickly if an ember goes flying across the road or the wind picks up. I’m not too worried, seems like the biggest threat is over. That’s insane! Glad to hear you guys are alright though.